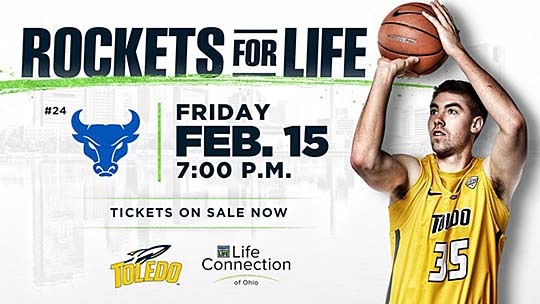 The University of Toledo and Life Connection of Ohio will hold the third annual Rockets for Life game this week to promote awareness for organ donation. The Rockets host No. 24 Buffalo in Savage Arena Friday, Feb. 15, in a 7 p.m. tipoff that will be televised nationally on ESPNU. Before and during the game, Savage Arena will be flooded with Donate Life messages, including videos, announcements, on-court features and promotions. Fans are encouraged to join Head Coach Tod Kowalczyk, UT staff and Life Connection of Ohio volunteers by wearing neon green and navy to show their support for the cause. In addition, 4,000 neon green Rockets for Life T-shirts sponsored by Coke, Life Connection of Ohio and the Sign Lady will be given away. Organ donation is something that has touched Kowalczyk personally. One of his best friends, Trey Schwab, received 12 additional years of life because of a double lung transplant. Schwab, who coached at the college, Continental Basketball Association and National Basketball Association levels, passed away in 2016 waiting for another transplant. An awareness event like Rockets for Life couldn’t come at a more crucial time. Currently, there are more than 115,000 people on the national transplant waiting list; this includes 3,000 Ohioans. The organ shortage continues to grow at a staggering rate, as another person is added to the waiting list every 10 minutes. Sadly, 20 people die every day waiting for an organ transplant. The good news: One person has the power to save up to eight lives through organ donation and heal 50 more through tissue donation. Life Connection of Ohio is the nonprofit organization that has promoted and facilitated organ donation in northwest and west central Ohio for more than 25 years. Last year, Life Connection of Ohio coordinated the recovery of organs from 74 donors, providing 233 life-saving transplants. For more information or to register as an organ, eye and tissue donor, visit the Life Connection of Ohio website. Tickets for the game are available for the special price of $8 if purchased prior to game day with the promo code RFL. This entry was posted on Wednesday, February 13th, 2019 at 3:31 am and is filed under Athletics, Events .